The use of alcohol and tobacco is highly prevalent. Studying the rate of consumption in a non-selected population could contribute to the elucidation of pathways involved in addiction or to the development of prevention programs. The San Antonio Family Heart Study has approximately 1,400 members with longitudinal data and did not select the proband with regard to exposure status. The goal of this study was to perform genome-wide linkage analysis of the rate of alcohol and cigarette consumption in a "normal" population. We used SOLAR to perform variance-components based analysis of the transformed maximal rate of consumption. 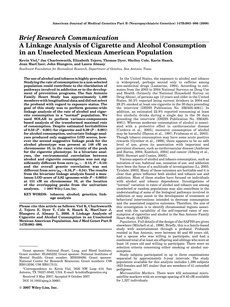 Despite estimated heritabilities of 0.52 (P < 0.001) for cigarette and 0.39 (P < 0.001) for alcohol consumption, univariate linkage analyses produced only suggestive LOD scores, however the second suggestive linkage peak for the alcohol phenotype was present at 148 cM on chromosome 10, in the exact vicinity of the peak for the cigarette phenotype. In a bivariate analyses, the environmental correlation between alcohol and cigarette consumption was not significantly different from zero (rho(e) = -0.15, P = 0.18) and the overall genetic correlation was not different from zero (rho(g) = 0.16, P = 0.34). The results from the bivariate linkage analysis found a maximum LOD score of 3.82 (genome-wide P = 0.0054) at 151 cM on chromosome 10, at the location of the overlapping peaks from the univariate analyses.